Been There Done That, Finally Getting It Right! Students with autism have specific needs and learning styles that can challenge even the most experienced teachers. Learn what, why and how to create a meaningful education for a student with autism based on sound science and plenty of real life experience. Written from the perspective of a mother and a special education teacher, this book has been written to encourage you, the teacher and the parent. 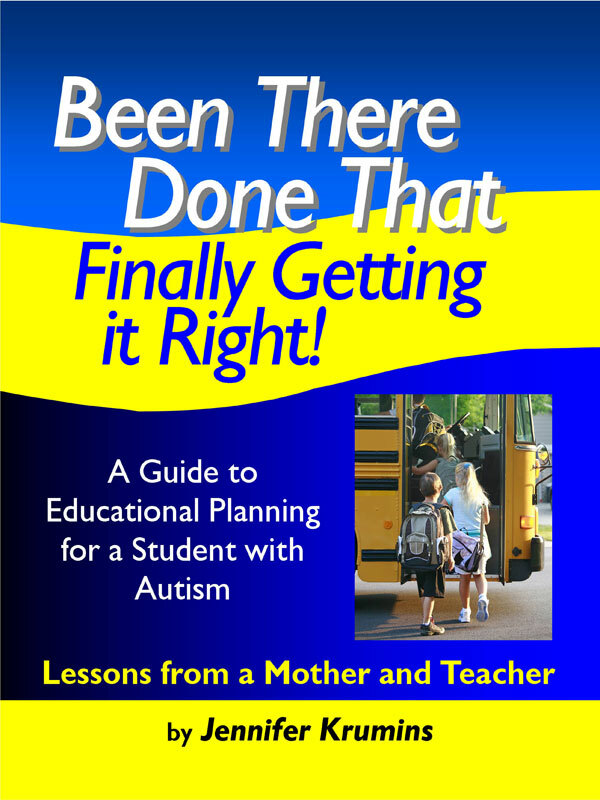 It aims to provide easy to read, down to earth, common sense advice in creating an effective educational plans and programs for students of all ages with autism. Through research and hands on experience as a mother and a teacher of individuals with autism, the author offers a comprehensive account of what autism looks like in the classroom and practical strategies about how educators can teach to these core deficits and strengths. The book provides answers to: What is this thing called an Individual Education Plan? What s the point of an IEP? And does it really matter? An explanation in non jargon terms of really important terms that will be a part of educational planning and programming is included as well as a personal account of the perspective of a teacher and a mother in educating a student with autism. The author presents ideas about how to work in collaboration as a team since it is in essence a team that must educate a child with autism. The book includes a detailed account of how to write meaningful and measurable goals and objectives that match the needs of a student with autism. In addition, there is a detailed inventory of what needs to be in an Individual Education Plan for a student with autism and an extensive list of possible accommodations, modifications and goals and objectives. The book is a practical goldmine with a whole section that is devoted to creating truly effective transition plans and documents that help teachers and parents to plan before during and after an IEP meeting. Finally, a book written by someone who has been there and done that! > What Does Autism Spectrum Disorder Look Like in the Classroom? > How Do I Teach this Kid? > Is an Individualized Education Plan (IEP) Really that Important? > The Gold Standard: What We Are Working Toward? You can purchase the book online from Smashwords in multiple eBook formats at http://www.smashwords.com/books/view/95667.